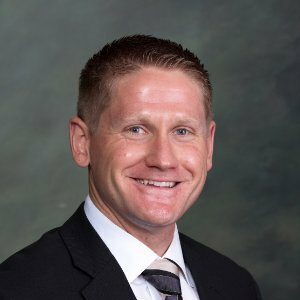 Auto loan originations are slowing, now what? For an industry that has grown accustomed to sustained year-over-year growth, recent trends are concerning. 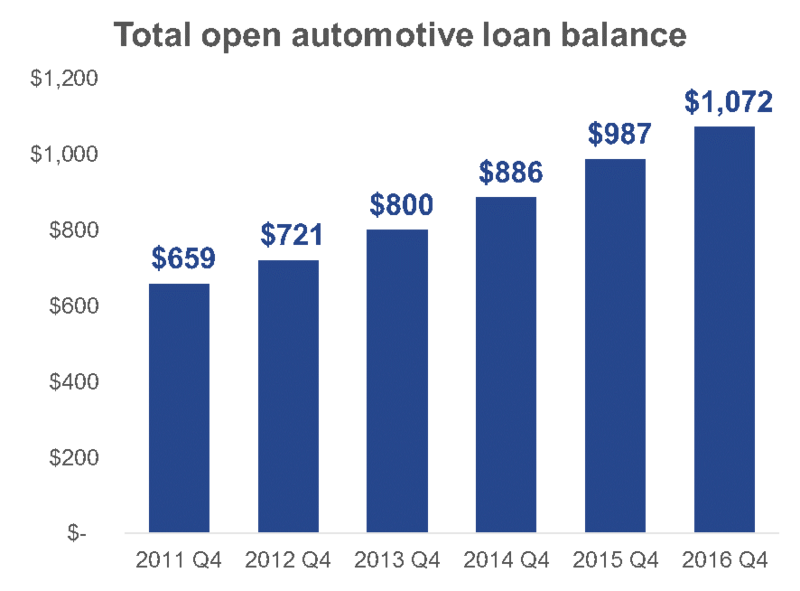 The automotive industry continued to make progress in the fourth quarter of 2016 as total automotive loan balances grew 8.6% over the previous year and exceeded $1 trillion. However, the positive trend is slowing and 2017 may be the first year since 2009 to see a market contraction. 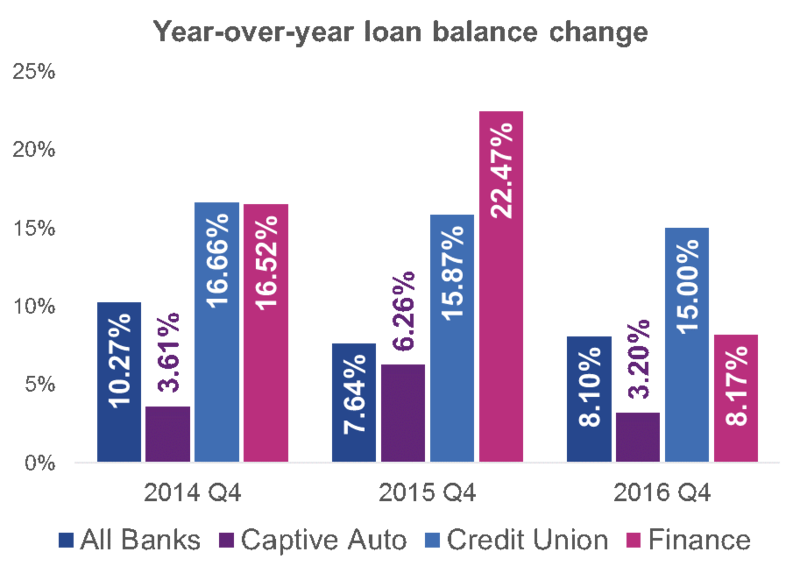 With interest rates on the rise and demand peaking, automotive lending will continue to become more competitive. Lenders can be successful in this environment, but must implement data-driven targeting strategies. Credit unions experienced the largest year-over-year growth in the fourth quarter of 2016, increasing 15% over the previous period. As lending faces increasing headwinds amid rising rates, credit unions can continue to play a greater role by offering members more competitive rates. For many consumers, a casual weekend trip to the auto mall turns into a big new purchase. Unfortunately, many get caught up in researching the vehicle and don’t think to shop for financing options until they’re in the F&I office. With approximately 25% share of total auto loan balances, credit unions have significant potential to recapture loans of existing members. Successful targeting starts with a review of your portfolio for opportunities with current members who have off-book loans that could be refinanced at a lower rate. After developing a strategy, many credit unions find success targeting these members with refinance offers. Helping members reduce monthly payments and interest expense provides an unexpected service that can deepen loyalty and engagement. But what criteria should you use to identify prospects? As originations continue to slow, marketing response rates will as well, leading to reduced marketing ROI. Maintaining performance is possible, but requires a proactive approach. Propensity models can help identify consumers who are more likely to respond, while estimated interest rates can provide insight on who is likely to benefit from refinance offers. Propensity models identify who is most likely to open a new trade. By focusing on these populations, you can cut a mail list in half or more while still focusing on the most viable prospects. It may be okay in a booming economy to send as many offers as possible, but as things slow down, getting more targeted can maintain campaign performance while saving resources for other projects. When it comes to recapture, consumers refinance to reduce their payment, interest rate, or both. Payments can often be reduced simply by ‘resetting’ the clock on a loan, or taking the remaining balance and resetting the term. Many consumers, however, will be aware of their current interest rate and only consider offers that reduce the rate as well. Estimated interest rates can provide valuable insight into a consumer’s current terms. By targeting those with high rates, you are more likely to make an offer that will be accepted. Successful targeting means getting the right message to the right consumers. Propensity models help identify “who” to target while estimated interest rates determine “what” to offer. Combining these two strategies will maximize results in even the most challenging markets. Much of the growth in the auto market has been driven by relatively low-risk consumers, with more than 60% of outstanding balances rated prime and above. This means hypercompetition and great rates for the best consumers, while those in lower risk tiers are underserved. Many lenders are reluctant to compete for these consumers and avoid taking on additional risk for the portfolio. But trended data holds the key to finding consumers who are currently in a lower risk tier but carry significantly less risk than their current score suggests. In fact, historical data can provide much deeper insight on a consumer’s past use of credit. As an example, consider two consumers with the same risk score at a point in time. While they may be judged as carrying similar risk, trended data shows one has taken out two new trades in the past 6 months and has increasing utilization, while the other is consolidating and paying down balances. They may have the same risk score today, but what will the impact be on your future profitability? Most risk scores take a snapshot approach to gauging risk. While effective in general, it misses out on the nuance of consumers who are trending up or down based on recent behavior. Trended data attributes tell a deeper story and allow lenders to find underserved consumers who carry less risk than their current score suggests. Making timely offers to underserved consumers is a great way to grow your portfolio while managing risk. The automotive industry has been a bright spot for the US economy for several years. It’s difficult to say what will happen in 2017, but there will likely be a continued slowing in originations. When markets get more competitive, data-driven targeting becomes even more important. Propensity models, estimated interest rates, and trended data should be part of every prescreen campaign. Those that integrate them now will likely shrug off any downturn and continue growing their portfolio by providing valuable and timely offers to their members. Experian wins for a second year in a row at coveted Fintech Breakthrough Award program, which received more than 3,500 nominations from across the globe. Discover how to improve customer experience, increase conversion rates, drive site traffic, and lower cost per acquisition with Text for Credit™. Read more! Alternative Credit Data and Trended Data have different strengths, but when used together, they can make a world of difference on your strategy as a whole. In the head to head match up between alternative credit data and trended data, who will win? Both offer value above and beyond traditional credit data.